In less than a year, we’ve had two major movies about Winston Churchill released in cinemas – the first being Churchill with Brian Cox in the title role, released back in June – both with admirable qualities to them including their strong dramatic flair and of course two fantastic performances by their lead actors, but both of them also run out of steam by the time the credits pop up, and don’t offer as astounding or as compelling a story as they think they’re telling. Out of the two, the debate over which one is better is honestly hard to call – as flawed as both Churchill and now Darkest Hour turned out to be, they are both a couple of movies that deal with exceptionally difficult times in his time as wartime Prime Minister with a strong creative force backing them, and are propelled even further by who they got to play the part. In this case, it’s Gary Oldman’s turn to portray Winston Churchill, who in this movie is summoned by King George VI (Ben Mendelsohn) to form a government in 1940, after outgoing Prime Minister Neville Chamberlain (Ronald Pickup) reluctantly picks him as his successor over preferred favourite Lord Halifax (Stephen Dillane). Churchill is at first met with serious disdain from his fellow politicians, due to his past mishandling of the Gallipoli Campaign during the First World War, his switching allegiances from the Conservatives to Labour on more than one occasion, and his absolute refusal to consider peace talks with Nazi Germany, among many other things. The bulk of the movie is of Churchill trying to overcome such fierce antagonism, to a point where certain characters even consider sparking a vote of no confidence by resigning in droves, and finding a way to convince the general public that, despite strong setbacks in Europe, they are as strong a nation as they ever have been. In between all of that, he communicates with his personal secretary Elizabeth Layton (Lily James) and his wife Clementine (Kristin Scott Thomas) and, from both women, learns a bit more how to be the beloved figure he would soon come to be. Let’s get one thing out of the way first, and it’s one thing you probably already know about this film: Gary Oldman is absolutely outstanding as Winston Churchill in this film. Under impressive make-up that makes him barely recognisable, Oldman manages to capture all the quirks and mannerisms that the man himself was known for, from his dry and hearty wit to his brash and larger-than-life personality, but makes it a bit more than a mere caricature of the man. He finds the humanity in someone faced against incredible odds, and with an extraordinary amount of weight on their shoulders from trying to lead the country during wartime, as well as keep one step ahead of Hitler and his growing influence in Europe. Beneath his hardened exterior, which we as well as a large amount of the characters are subject to at multiple points, is a soft and even cuddly creature whose desire to encourage the very best out of people even in a time of crisis is inspirational to say the least, and Oldman makes his interpretation of the character one that we can be laughing along with one minute, and then the next feel great sorrow for moments when it feels like he is at his least effective. Oldman, who over the years has put in great performance after great performance, even in movies he couldn’t care less about being in, is so entertaining in this movie that it’s almost worth recommending just to see his performance alone, and whilst it’s probable he’ll be walking away with his first and long overdue Oscar next month for this role, it would also be for a career filled with outstanding credits, with his one for Darkest Hour being just one of many to choose from. As much as it’s got a highly enjoyable lead performance, the rest of the film tends to struggle to catch up to his greatness in this movie. It’s not a poorly made movie by any means; director Joe Wright has a tight hold on scenes of genuine drama (and it’s an acceptable apology for his last film, the great offense that was Pan); writer Anthony McCarten puts in a good few zingers every now and then; and the cinematography by Bruno Delbonnel really brings out the gloominess of the wartime environments of London to gorgeous effect. However, the whole thing lacks a certain wow factor that really puts it among the top films about this real-life figure, even though creatively it’s probably the most ambitious; the way it’s paced, and sometimes even the way it’s filmed, it’s like a made-for-television movie that’s been blessed with a larger-than-normal budget, one that doesn’t offer new insight into the life or career of Winston Churchill but would serve perfectly fine as afternoon or evening viewing on any BBC channel you can think of. It might also have something to do with how the story they chose for this film isn’t exactly the most riveting one to go with; to give credit to Churchill from last year, that film had a more fascinating dramatic angle which focused on Churchill’s reluctance to approve the D-Day landings, whereas this one is more of an underdog story which doesn’t have much weight to it because everyone knows pretty much how it will all go in the end. As finely made and certainly well-acted as Darkest Hour is, it just doesn’t have as strong a story as Churchill did. As to which film is better, again it’s hard to say; both are flawed looks into the life of an extremely flawed man, but both of them also manage to take very different aspects of Winston Churchill’s time as Prime Minister and present as strong a movie as they could from their craftsmanship and especially acting credentials. I’d say if you want a film that sees him in a much more dramatic and emotional conflict, Churchill is the one for you; but if you want something that may not be as powerful but is still highly entertaining thanks to a combination of raw creative talent both on and off the screen, then Darkest Hour should be your essential Churchill movie to check out. 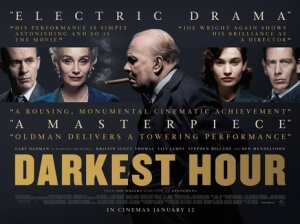 Darkest Hour features a magnificent lead performance by Gary Oldman, but as a full-on biopic of Winston Churchill it has some notable creative ambitions but ultimately not much of an emotional centre to make it something really special.